Ocotillo — fouquieria splendens — is one of my favorite plants. I’d first seen these amazing plants in the desert and found them fascinating; from the car window they appeared like desiccated, thorny sticks, providing sculptural punctuation in the landscape; other times they bristled with green. It wasn’t until later, during a misbegotten year-long stint in Phoenix, that I really fell hard for them … living in Arizona I got to see ocotillos close-up, in full leaf and, most spectacularly, in bloom. There they were used in both civic and commercial landscape designs, offering the same sculptural interest as they did in their natural setting. Back in California I tried to have an ocotillo here and there, but they never took … I figured Long Beach wasn’t providing enough of a true desert experience for the ocotillo, so didn’t press the matter. 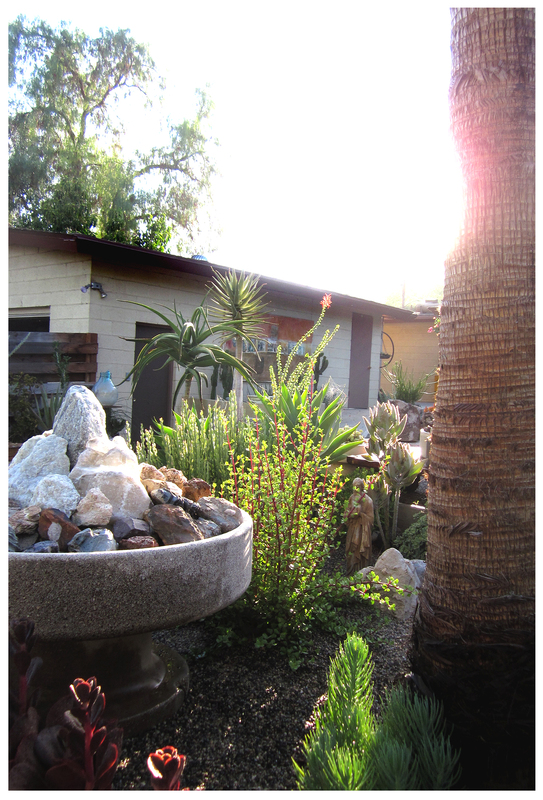 When we moved to Riverside and the Rancho, I decided I’d try the ocotillo again … and they took to the place. 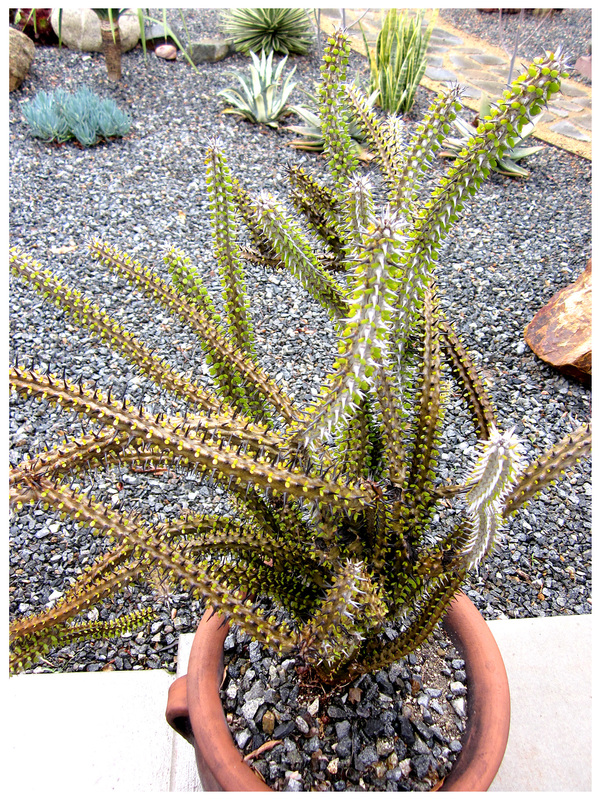 I’ve got two: a gnarly, twisty multi-armed one on the front patio (click here for pic), and one in the back; both in pots. As ocotillos tend to do, they’ve looked pretty much dead at times: completely devoid of foliage and life; lately both’ve looked pretty good, retaining their circular leaves between rows of thorns … and making me happy. This past weekend, though, my ocotillo-happiness really grew when I saw that my backyard plant had crowned itself in splendiferous new blooms! 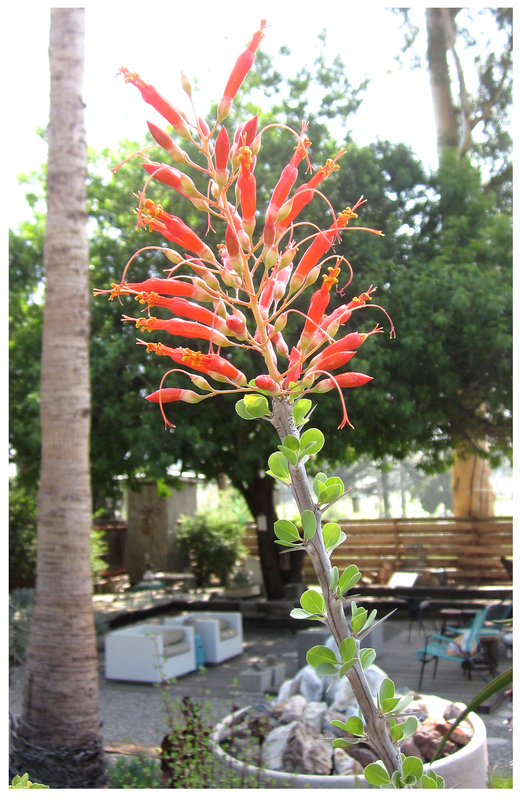 One of ocotillo’s many nicknames is desert coral and the intense red-orange of the blossoms is a close match for the jewel-like tones of that marine gemstone. Tubular blossoms, with stamens jutting like filigreed accents, I’m really entranced by this ocotillo’s display. This particular ocotillo has never retained its leaves for so long, almost 3 months; usually losing them all after a month or so. Some of its current foliage is becoming yellow, a sign that the plant will be dropping its leaves soon … This used to panic me, but now, I know it’s part of the plant’s natural cycle and the leaves will return eventually. This picture taken in the late afternoon, just before the sun dips behind Mt. Rubidoux, backlights the ocotillo blooms, making them even more dramatic, as they stand taller than the surrounding plant material … I took this picture hoping to capture both the blooms and another exciting natural phenomenon: the return of that diffuse quality of light that signals Fall is almost here. I’ve been noticing this change in the day’s light since last week, and it’s exciting … although this has been a relatively mild summer, I’m all for rushing into Fall. Sadly, I could never get these beauties to grow in my yard in Phoenix. And even if they grew a little, they never bloomed. I kept them for sculptural value, though. You’re lucky! I think I’m lucky, too! 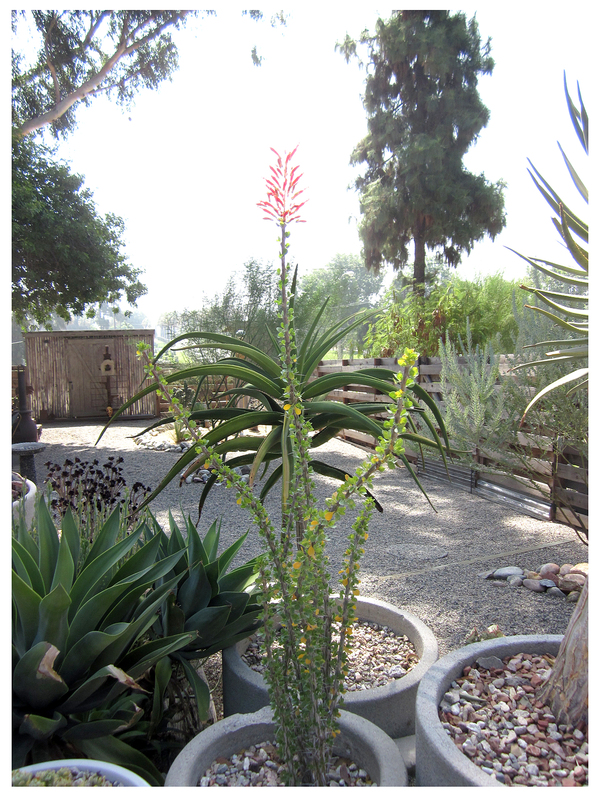 I dream of an Ocotillo fence, seeing yours blooming takes those dreams to a new level! 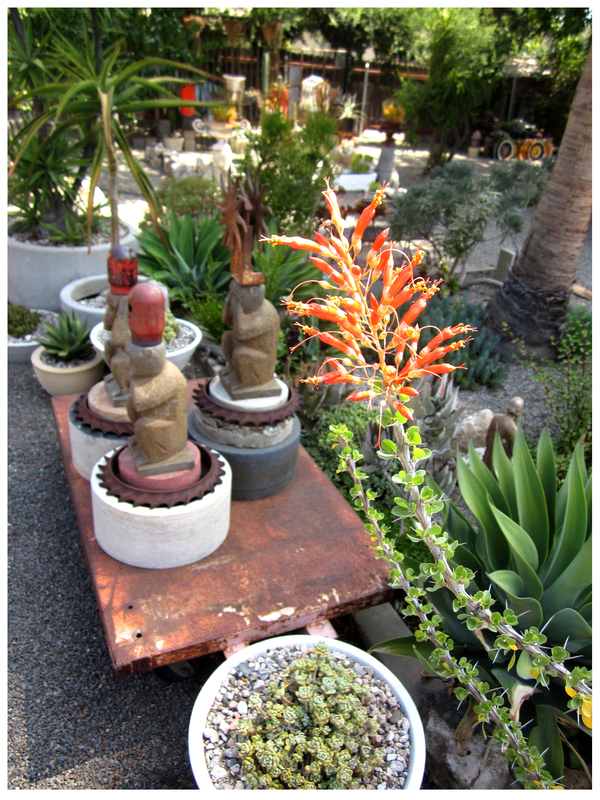 I love an ocotillo fence, too … so gnarly-natural! Congratulations on being featured in the Fresh Dirt blog! Sunset! That’s pretty big, right? Your garden is amazing, so you totally deserve it. Yay Rancho! Hells yes, I think being on Fresh Dirt is a big deal … and, I think it ‘s positive reader energy that got me there … thank you, MM! Sending more positive reader rays your way, so look out!